Writer-director Michel Gondry makes movies about creative people doing creative things. His characters scramble in organized chaos, assembling oddball genius out of everyday objects, always working on the verge of an epiphany. Sometimes this approach works (Eternal Sunshine of the Spotless Mind) and sometimes it fails (The Science of Sleep), depending on if his haphazardry and structure achieve equilibrium. 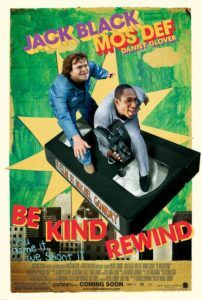 Be Kind Rewind has a novel concept, celebrating independent filmmaking with a guerilla-style approach none too far from Gondry’s own technique. The story begins in a world where in Passaic, New Jersey, a video store renting solely VHS tapes still exists. Run by old-timer Mr. Fletcher (Danny Glover), the run-down shop resides on a street corner set to be demolished to make way for a block of new apartment buildings. Fletcher insists that years back, jazz legend Fats Waller was born in his very building, thus making his shop historically significant. Alas, he still needs $60-thousand to bring his place up to code, otherwise, he’s off to The Projects. Nevermind that the world has moved on to DVD some ten years ago (and is now again advancing formats to Blu-ray); Fletcher’s clear detachment from the home video market prompts the coming plot. When he leaves town for market research (spying out a window with binoculars at a competing Blockbuster-type rental franchise), he leaves his sole employee Mike (Mos Def) to run the store. Mike’s friend and frequent rental customer Jerry (Jack Black) lives in a junkyard trailer, and he believes a nearby power plant affects his brain. With plans to sabotage it, Jerry can’t convince Mike to join, so he goes alone. Through a series of impossible events, Jerry is magnetized. Metal objects dash at him and he finds himself sticking to lampposts. And after entering Mr. Fletcher’s video store to visit Mike, he inadvertently erases the already meager stock of outdated VHS tapes (featured behind the register is a poster for the 1999 Brendan Fraser comedy Blast from the Past, clearly a hot item). Mike and Jerry resolve to replace the erased tapes by shooting their own versions of classic movies. Despite nonexistent budgets and nil production value, their neighborhood supports their ramshackle home creations, constructed with found objects and surefire invention. Along with their partner, a local named Alma (Melonie Diaz), they decide to include virtually all of Passaic in their slew of homemade adaptations, charging more for rentals, but offering customers a chance to be in their latest pictures, all with hopes of earning enough to save Mr. Fletcher’s store. If you’ve ever experimented in making a short with little-to-no equipment, their spoofs on classics like Ghostbusters, Robocop, and 2001: A Space Odyssey will look familiar, delightfully so. As Mike and Jerry tell people their movies are from Sweden, hence the abbreviated twenty-minute running time and high rental charge, Gondry has helped develop a new verb: “Sweding,” meaning to create a homemade spoof of established material. And it’s catching on, at least in Web and filmmaking circles. Indeed, Gondry even Sweded his movie’s trailer to hilarious results (check it out HERE). 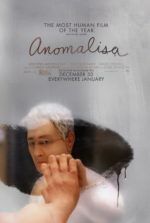 The film works with quirky, bizarre humor enhanced by Gondry’s subtle manipulation of the cinematic apparatus to delicately augment the comedy. We imagine his process doesn’t differ too greatly from Mike and Jerry’s, running about in slapdash fashion, shooting sometimes unpredictable ideas with no concern for the increasing length of film stock used. And yet, paradoxically, I suspect it takes vast coordination and pre-planning to shoot Gondry’s brand of unpolished spontaneity. 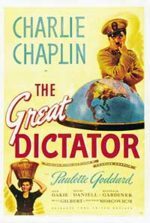 One sequence streams between maybe a dozen spoofs with seamless editing and organic flow, illustrating the director’s illusory, deceptive randomness. Be Kind Rewind teeter-totters up and down in Gondry’s frequent balancing act, leaning perhaps too much toward the point of traditional organization with the film’s hokey save-the-building backstory. But the film’s delightful and inspiring manic inventiveness never ceases to entertain. Some viewers may find the director’s tone weird or overly silly; Gondry’s cinematic worlds are incredible, imaginary places where the impossible is commonplace, if not expected, but he underlines everything fun and universal about filmmaking. I can imagine Gondry’s onset antics are just as amusing as the Swedes presented in this film, the only difference being a budget.